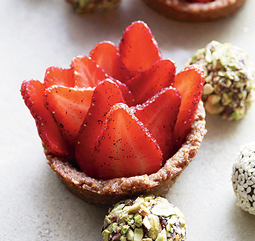 Strawberries in Ginger-Nut Cups - A recipe from Savor California, the online showcase for extraordinary gourmet foods and beverages from California. Photo by Sang An Photography. Lightly brush muffin cups with coconut oil. Set aside. Pulse nuts in a food processor until coarsely ground. Add 3 tablespoons unflavored agave syrup, flour, ginger, salt, and 2 teaspoons coconut oil. Process until coarse dough forms. Gather into a ball. Press 1 heaping tablespoon dough firmly onto bottom and up sides of each muffin cup. Chill for 1 hour. Bake nut cups until firm and golden around edges, 8-10 minutes. Let cool in pan on a wire rack for at least 10 minutes before removing. DO AHEAD: Can be made 1 day ahead. Let cool completely; store airtight at room temperature. Place strawberries, lemon juice, and vanilla agave syrup in a medium bowl. Stir well, crushing a few berries to release their juices. Using a table knife, remove nut cups from pan and fill with strawberries. Serve immediately.